isn't it starting to look like a series fixture? since we know V1, is it necessary to measure Vin? Sorry if I'm late to comment on the following questions. why not simply acquire both branches of the bridge using the 2 RPI inputs? I think that this kind of bridge was designed for devices with only one input. In case of Red Pitaya, if we can accurately measure both branches of the bridge then the common mode rejection can be done numerically. The other will be Vin /(50 + Z) * Z. By looking at the phase and amplitude one can measure Z. In my VNA configuration, three series of values are recorded synchronously: DAC samples, ADC1 samples and ADC2 samples. With the open/short/load calibration, there is enough information to calculate Z from the DAC samples and ADC1 samples. 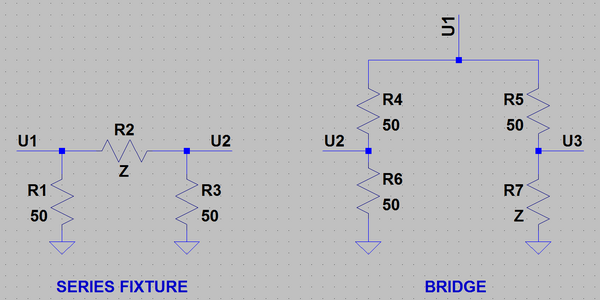 Single bridge branch and series fixture look like equivalent circuits. What I still don't understand is what is the advantage of bridge over series fixture? fisafisa wrote: In that case one could duplicate the circuit and make a 2 port measurement. Just a silly idea, but I cannot be convinced we need a complicated bridge since we have 2 ports? From what I've read so far, I conclude that directional coupler has the best performance and series fixture has the simplest schematics. I don't understand what are advantages of the remaining configurations (shunt fixture and bridge). This configuration gives me good results in the 160m to 10m area. The BNC connector let me plug in a Short (0 Ohms) or Load (50 Ohms) resistor for the calibration. Following this topic I found it difficult to learn what is the final recommendation for using RP as antenna analyser? Are two T-links with 50 ohm termination on one side and probes on the other side enough or should we build something else? I am running the current stable RedPitaya OS and I also tried the current beta release RedPitaya OS. After I launch my browser I connect to the WebUI of RedPitaya and launch the VNA application. Then I launch the vna.py on my linux client or VNA client for Windows. I can sweep and use the software without any issues but ==> the results differ from the results of well-known analyzers like RigExpert, SARK or miniVNA. The SWR and return loss data RedPitaya/VNA returns are shifted about 150-350kHz. For example: the transceiver or Rigexpert Analyzer shows resonance frequency at 14.150kHz and Redpitaya/VNA shows 13.870kHz. (1) according to my attached photo there is nothing connected on the right side of the reflection bridge. I used the calibration button for "OPEN"
(2) then I took a small part of copper wire and bridged the inner core of the SO239 with the outer area of SO239. Then I clicked on calibration button "SHORT". I did not touch the wire and was about 2m away from RedPitaya. (3) then I removed the bridge and on this SO239 socket I entered a 50 Ohm resistance, one end to the inner core and the other end to the outer area of the SO239 socket. Again, I did not touch the resistance and I was about 2 meters in distance from Red Pitaya. I clicked the calibration button "LOAD". I also tried using a dummy load for step (3) instead of the 50Ohm resistance. It didn't help either. What am I doing wrong? How can I get "real" results? Any help appreciated. I am running the current stable RedPitaya OS and I also tried the current beta release RedPitaya OS. As far as I know, the SD card images available from http://redpitaya.readthedocs.io/en/late ... Dcard.html have a compatibility problem. If you're using vna.py, then it's better to use this version. The latest version in the master branch isn't compatible with the VNA application from the application marketplace. I updated the code but didn't have time to update the pre-built binaries. It's still OK to use the VNA application from the application marketplace with the client application for MS Windows. ==> the results differ from the results of well-known analyzers like RigExpert, SARK or miniVNA. The SWR and return loss data RedPitaya/VNA returns are shifted about 150-350kHz. For example: the transceiver or Rigexpert Analyzer shows resonance frequency at 14.150kHz and Redpitaya/VNA shows 13.870kHz. At the moment, I don't see what could be the source of this problem. I'll try to update all the pre-built binaries as soon as possible. Then it'd be great if you could repeat the tests with the updated version. pavel wrote: [As far as I know, the SD card images available from http://redpitaya.readthedocs.io/en/late ... Dcard.html have a compatibility problem. As a workaround, I’d suggest to use the previous version (0.95) of the SD card images. Before I tried the latest stable and latest beta I was running 0.95.
pavel wrote: If you're using vna.py, then it's better to use this version. The latest version in the master branch isn't compatible with the VNA application from the application marketplace. I updated the code but didn't have time to update the pre-built binaries. thanks for clarification. I will use it on my Linux desktop. pavel wrote: It's still OK to use the VNA application from the application marketplace with the client application for MS Windows. Right, I was using the latest windows client version from market place with the mentioned client application for Windows. Ok let me know when you have done your updates and I will recheck. 2.) Maybe you can add a small info on the title bar header (the place where it says "Vector Network Analyzer" in bold) that shows which graph actually is shown on the screen. Most of times you know which function is selectec (Smith Chart, SWR, Return Loss, etc.) but when you have clicked on the button [Impedance] or [Refl.coeff] you cannot say which graph is displayed currently because the name of x- and y- axis are the same. Another question I have: is it possible to measure the impedance of a halfwave endfed wire with VNA? If I connect a single wire of 10m into the inner SO239 and click on [IMPENDACE] button ... is that the result in Ohm ? Or do I need the LCR meter for that purpose? I've just updated all the VNA related files. Could you give them another try? This new version won't probably solve your problem but having our versions synchronized will help in finding the source of the problem. Please explain which applications I need to replace and where to download. Currently on my MMC card I have installed VERSION 0.95 FROM THAT LINK you provided, should I stay on 0.95 ? Download customized SD card image zip file. so I need to download THIS SD CARD IMAGE and write it onto my MMC ?